Condensation "fog" in terrarium soil. Operation Diagnose: I'm wrapping up the "Operation Diagnose" week with a combination of two questions I received this week that aim at the same topic: temperatures for terrariums. a) our house doesn't get much light as the southern exposure faces dense woods and the windows are east and west facing... so we don't put them against the window or they could fry in the direct light, but elsewhere in the house isn't enough? b) we like our AC temp set cooler than moss or ferns care for (75-77)? And the question from reader Ian: I planted a terrarium. As soon as I added the soil moisture seemed to be between the dirt and the glass. It doesn’t look like condensation. It looks like fog. TL:DR Answer: Terrariums need to be out of direct sunlight so they don't overheat and fry, but other than that they should be fine in regular indoor temperatures. Nesting Ranch, your indoor house temps are fine. 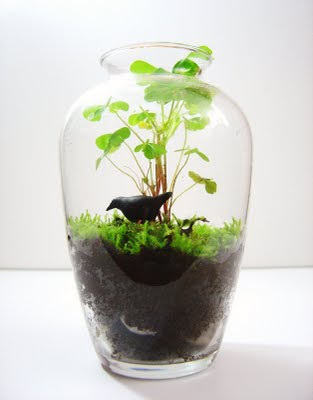 The beauty of terrariums is that they thrive in the temperatures that us humans prefer to keep in our homes. The main temperature concern for terrariums is overheating. What are symptoms of an overheated terrarium? An overheated, open-top terrarium could get dried out quickly - with bone dry soil and dried out plants. An overheated, lidded terrarium would have wilted plants, excessive condensation on the glass, and the excessive appearance of steam or fog between the soil and the glass. Please note the emphasis on "excessive." The fog-appearance of water condensation around the soil and the glass is pretty normal if it looks like the terrarium pictured at the top of the post. If you notice fog, I would caution you to track what times of day and how frequently you see the fog. It is common for a terrarium to steam up when it is in direct sun (and it shouldn't be in direct sun all day - maybe 45 mins at most). If you see the fog around the clock- your terrarium may be getting overheated due to being too close to a window or other heat source. Overheating, in the long run, contributes to disease and plant rot. With that said, terrariums will need sufficient indirect light. They need to be kept in the general vicinity of a window but not right next to it and not anywhere that direct sunbeams are hitting them for too long of periods. Yes, I bet that in Arizona the space near the windows would get quite hot. Do you have better luck keeping them somewhere else in the room?